Speedex Future is a balanced complementary protein feed for young, growing horses and for pregnant and lactating mares and for performance horses in intensive training. It’s also suitable for all horses as a complement to forage with low protein content. 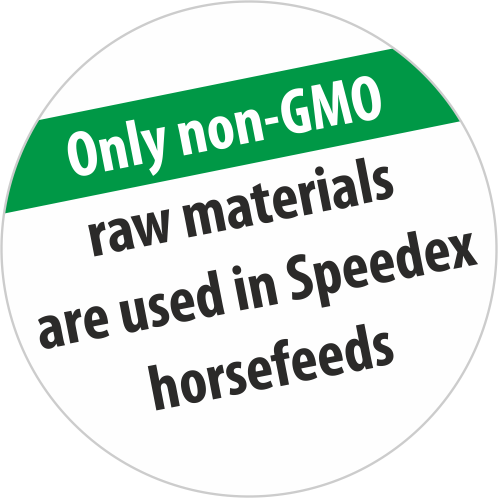 The protein in Speedex Future comes from non-gmo soybean meal. Other protein sources are rapeseed meal, linseed meal and wheat bran. The amino acids lysine and methionine have been added to the feed. Speedex Future contains infredients that promote optimal gut function, just like all Speedex-feeds. YEA-SACC® and BIO-MOS® are good for the gut flora and MYCOSORB A+® contributes to managing the impact of mycotoxins. The trace elements in Speedex Future are BIOPLEX®-chelates that supply the horse with trace elements in a form as close to nature as possible. Soybeanmeal, wheat bran, barley, rapeseedmeal, sugar beet pulp, grass meal, linseed cake, liquid molasses, vegetable oil, salt, calcium carbonate, lycin, magnesium phosphate, monocalcium phosphate, methionine, premix, flavor, MYCOSORB A+®, BIO-MOS®, YEA-SACC®, SEL-PLEX®, BIOPLEX®.